Good news for the Aspirants looking for job in Central Government, now Indian Coast Guard (ICG) published an official notification for many post to fill the Navik(Domestic Branch (cook and steward)), work in anywhere in India. Candidates must go through the official ICG recruitment notification thoroughly before apply for Navik(Domestic Branch (cook and steward)) post. ICG Navik DB job application is collected through Online mode only. The applicant meets the eligibility norms of ICG only apply for the Navik(Domestic Branch (cook and steward)), else ignore. Aspirants have a golden opportunity in the ICG. Applications are invited to the Navik DB in Indian Coast Guard (ICG) . Aspirants can apply only by Online, application forms is available online from 15.10.2019 to 29.10.2019 17:00 to the ICG latest job notification 2018. The Aspirants are requested to read some basic information about the ICG job notification 2018 like eligibility criteria, age limit, selection process and more given below. 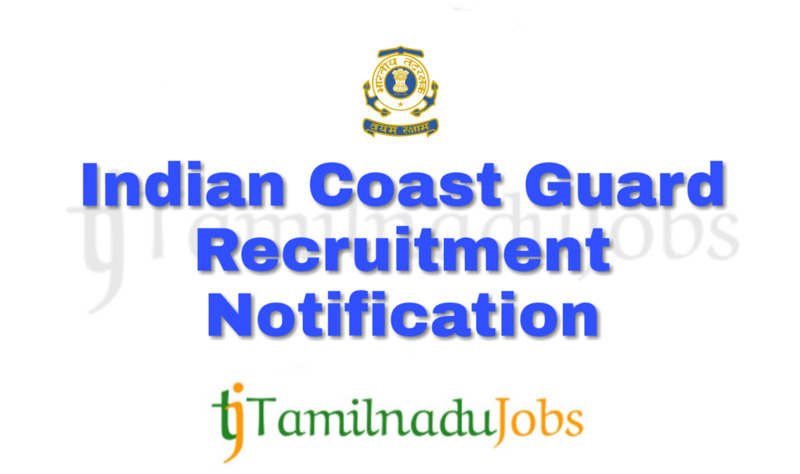 Before applying, candidates are requested to read the official notification of ICG Recruitment 2018 for more detail and correct information on their official website(http://joinindiancoastguard.gov.in/). 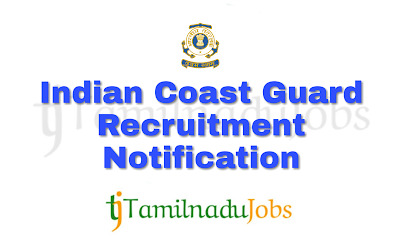 In the recent Recruitment Notification, the following vacancy details given by the Indian Coast Guard (ICG) and aspirants should go through the vacancy details and eligibility details for more detail in notification link given below before applying. Vacancy details of ICG is given below. No of post is not mention in the recruitment notification of ICG. Here we give only the education and age limit criteria for the ICG Recruitment notification 2018. Furthermore detail eligibility details like physical fitness and more, read official notification. Before apply for Navik(Domestic Branch (cook and steward)) job, candidates must go through the eligibility details in official notification of ICG Navik(Domestic Branch (cook and steward)). Aspirants meet the education qualification of Indian Coast Guard (ICG) only apply for the Navik(Domestic Branch (cook and steward)) job. ICG notification 2018, education qualification are given below. Cook: 10th Class with 50% marks in aggregate from a board of Education recognized by Central/State Government. They would be required to prepare food as per menu (both vegetarian and non-vegetarian including handling of meat products) and accounting of ration. In addition, they will also be allotted other duties for efficient running of the organisation. Steward: 10th Class with 50% marks in aggregate from a board of Education recognized by Central/State Government. They would be required to serve food in the officer’s messes as waiters, housekeeping, maintenance and accounting of funds, wine and stores handling, preparation of menu etc. In addition, they will also be allotted other duties for efficient running of the organisation. Aspirants who want to apply for ICG Navik DB 2018, must attain the following age limits given by Indian Coast Guard (ICG) . Given Age attained aspirants can apply for the ICG Navik DB job. Aspirant must be minimum age limit is 18(31.03.2001(date inclusive)) and maximum age limit is 22(01.04.1997(date inclusive)) to apply for the ICG Navik(Domestic Branch (cook and steward)) 2018. The application fees for Indian Coast Guard (ICG) Navik DB 2018 differ according to various categories. Aspirants will have to pay the application fees for ICG Navik DB via Online modes only. The application fees details for ICG Navik DB given below. Aspirants have to pass the following selection process given by Indian Coast Guard (ICG) to get Navik(Domestic Branch (cook and steward)) job. For more detail and correct information check in the official website of ICG. The Test procedure will take two to three days. How to Apply ICG Navik DB 2018? Step 3: Fill the details required by ICG recruitment form. Step 5: Before submitting the application check the details are correct, then press submit and pay the application fee. Indian Coast Guard (ICG) is announced the recruitment for the Navik DB to full fill their many posts. Aspirants can check the salary details for the Navik(Domestic Branch (cook and steward)) in ICG. Navik(Domestic Branch (cook and steward)) job pay scale Rs.21700/- (Pay Level-3), plus Dearness Allowance and other allowances based on nature of duty/place of posting as per the regulation enforced time to time.